It's been two weeks since I finished this book and I cannot get it out of my head. Not like when one feels the barbs of love sticking in them and releasing an intoxicating poison (that is probably life-threatening) but like the sad and angry pangs of regret, the frustration and remorse at the end of a relationship that REALLY should never have happened. Indeed, more than once I thought the words "What the hell was I thinking?" This is not strictly because of the book, it is because five days after I finished it was the first anniversary of my own horrible, horrible heartbreak. That was a relationship no one around me understood, a relationship that felt like the entire world to me, and one that ended in betrayal so great that I nearly destroyed my own life in the process. So yes, I can relate all too well to this book, even though I have never dated a popular sports star and I never will (they are really not my type, but trust me, "smart" guys can break a girl's heart just the same). A lot of books about romance end when the relationship does, but usually there's a bit of gladness. Better to have loved and lost, the cliche goes. That is the case sometimes. Sometimes. But this is the story of a relationship that really was best left to the imagination, the what-ifs, because its reality was too painful. Maybe Ed didn't feel that way. Maybe he did actually love Min; in fact, I really don't doubt that he did at all. (He was not a bad person despite doing many, many bad things.) But Min could've done so, so much better than him and she will in the future, so seeing her fall for a guy who was not right for her at all is plain tragic, especially when the reader knows exactly what that's like. In particular, Min's breakdown and rambling list of all her flaws at the end is extremely true to life. When the heart is broken, everything else breaks with it, first of all the person's own belief in their own ability. Min is clearly an intelligent girl who could probably devote herself to the world of film (indeed, as I wish to do the same I could relate to that passionate love as well); she did not in any way deserve to be broken like that. What keeps the book from being depressing, aside from its great sense of humor, is the knowledge that Min will recover from what has happened and find happiness in the future. She's way too smart not to. 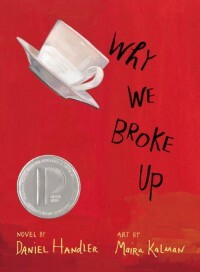 Indeed, any heartbroken individual will take solace in the book's underlying message that what becomes of the brokenhearted is so much better than they may be able to realize at the time. Even if their Ed, like my Jacob, never realizes the magnitude of how badly they hurt them. I believe my relationship with this book was definitely one that was meant to happen. It irritated me at times, made me happy at times, left me sad and frustrated when it ended, but in the end taught me more about myself and my heart than I ever expected. We should expect the same from our lovers as we do from our books.